There’s Nothing Better Than Corn! Ahhh, sweet summer corn. Is there anything better? Fresh, crunchy corn is so delicious and versatile. Personally, I love my corn with just a bit of seasoning, but a little smear of butter is the perfect complement to hot corn on the cob. 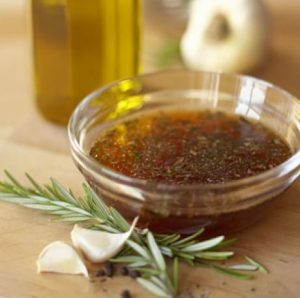 You can get creative with your butter by whipping in a bit of local honey, chili powder, fresh basil, roasted garlic…the combinations are endless! Traditionally boiled or steamed, corn is also amazing done on the grill. If you’ve already got your grill turned on for a sizzling summer barbeque, why not throw your corn on as well? Leave the stem on for an easy handle and roll it along the grill to heat it through and add some great color. Serve it just like that, or cut off the kernels and add them to fresh salsa, folded into whipped potatoes, or sprinkle on a salad- like my d’lish Summer Corn, Roasted Pepper, and Arugula Salad garnished with Goat Cheese Crostini! 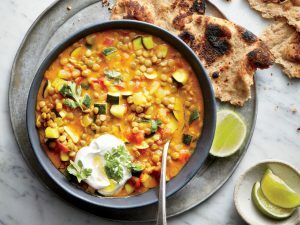 Not a fan of eating corn right off the cob? No problem- I have a great trick to share with you! Take a bundt pan, insert the corn into the center hole and carefully cut downwards as close to the cob as you can, without cutting into the cob. The bundt pan will catch the kernels for you! If you don’t have one, just hold the corn vertically, making sure the tip is firmly in place and cut downwards. And if you’re lucky enough to live in Seattle- I highly recommend checking out Pablo y Pablo. 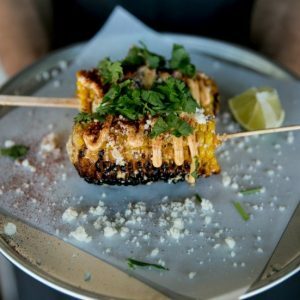 Located near Gas Works Park, this Mexican restaurant and bar knows how to treat corn right! Their Grilled Street Corn with chipotle aioli, cotija, green onion, cilantro, and lime is simply amazing. They even highlight corn in a totally different way with their Fried Hominy with chipotle salt. YUM! So go enjoy one of the best tastes of summer while you can– fresh picked, local corn! Meanwhile, spread toasted French bread slices with goat cheese, and place under a broiler for one minute or pop into a hot, 400-degree oven until cheese is warm.